The Indian rosewood classical guitar gallery is full of exquisitely handcrafted guitars by luthier John Bogdanovich. All guitars are custom made to suit the player. 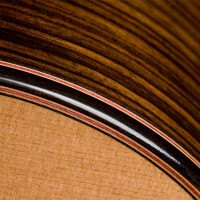 Indian rosewood is considered the standard for a classical guitar today. It makes a a striking set of back and sides. Only the richest looking, most stable quarter-sawn Indian rosewood is used. The wood has a rich, deep, dark purple color. Indian rosewood sounds good with either spruce or cedar soundboards. The guitars have a full, rich sound with a full tonal palette. The standard configuration incurs no additional costs. Below are photos of both spruce and cedar top Indian rosewood classical guitars. Currently koa is used for the bindings. 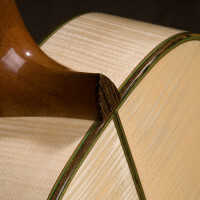 Bridges are typically Indian rosewood. Custom details can be requested. For example rosettes can also be made without the center wheat motif if desired. Get more information on features, specifications and pricing.